Montpellier have announced a host of new signings with England international Shontayne Hape and Bath outside centre Matt Carraro included. Carraro announced his departure from Bath back in March with Montpellier widely reported to be his next destination. 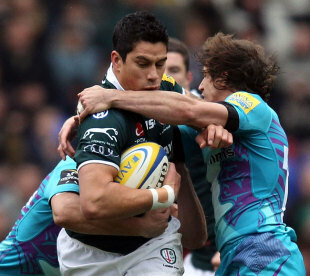 Hape, Carraro's former Bath team-mate, is currently lining up for London Irish but has endured an injury-ravaged season. Reports earlier this month suggested that Hape was battling to save his career but Montpellier have announced his signature on Friday, the day the transfer window opens in France. Hape is relishing the chance to ply his trade in another league. "I am very proud to join Montpellier - a club which has high ambitions and plays great rugby," Hape said. "This is a club that is on the way up and it'll be a new chapter in my career which is very exciting." With Montpellier announcing Hape's signature, his current club London Irish have thanked the centre for his year of service. "We wish him the very best of luck for his future career with Montpellier," Exiles' director of rugby Brian Smith said. "London Irish has some fantastic young and talented backs who have greatly benefited from training and competing alongside him. We look forward to watching those guys in action for the rest of this and next season and to announcing Shontayne's replacement very shortly." Another familiar face making the switch to Montpellier is Scotland No.8 Johnnie Beattie. Beattie last turned out for Scotland in the run up to the 2011 World Cup and currently plays for the Glasgow Warriors but will move cross-Channel at the end of the season. Montpellier have also announced four other signings: prop Vincent Pelo from Bourgoin, Brive winger Alexandre Bias, Perpignan's Charles Geli and Biarritz's Yvan Watremez.